Fully automated, simple to use, full budgetary management and supports allocation solution. Designed around industry recommended Care Plan Management documents. Empowers your organisation with maximum visibility to deliver the client’s care plan within the allocated budgets. Designed around industry recommended Care Plan Management documents, the Care Plan Management module provides a simple to use full budgetary management and supports allocations solution, including assignments and scheduling capability, allocation of chargeable cancellations, automated repetitive billing cycles as well as a the ability to generate a quote and a formal sign off document. 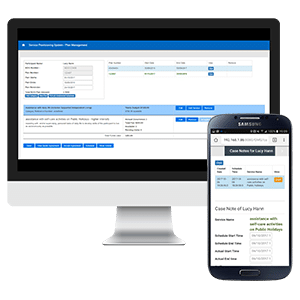 The fully automated system works in conjunction with the Combined Service Scheduling and Rostering Calendar module to constantly monitor available support units, funds and cancellation to maintain the client’s care plan within the allocated budgets.